The new block paved 'shared access' promenade in Blackpool is currently a bit of a shambles, with road subsidence, missing blocks having to be replaced with new patches of tarmac and continuing maintenance work, entailing temporary traffic lights and contra-flows, to patch up the sub-standard road surface of what is supposed to be a major North-South trunk route between Lytham and Fleetwood. 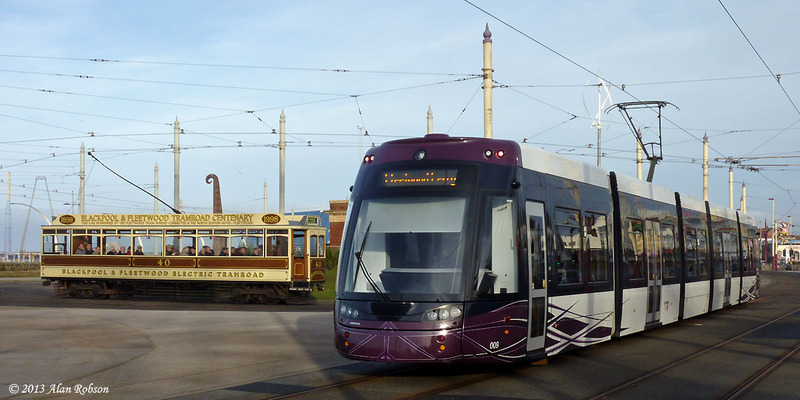 The previous tarmac dual-carriageway that ran between Central Pier and North Pier, which coped with the heavy traffic flows on this section, has been dug up and replaced by an inferior single carriageway at great expense on the whim of Blackpool Council. 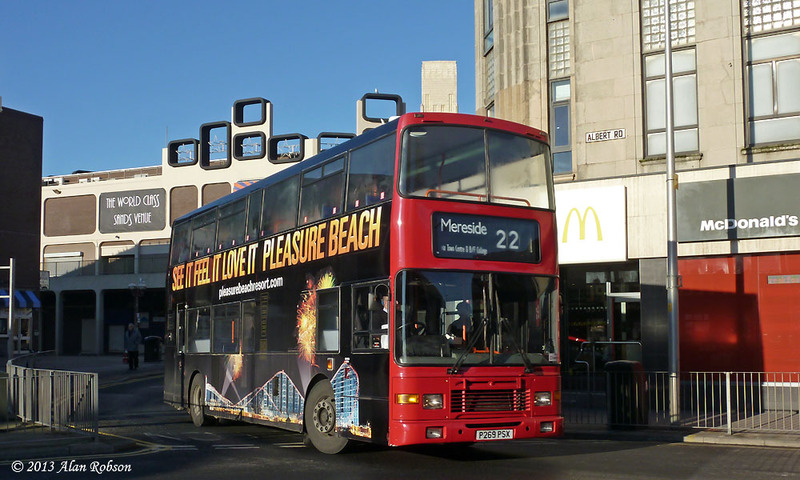 This has culminated in the present farcical situation whereby the promenade is now unusable between the Metropole Hotel and Central Pier during busy periods, due to the road capacity being halved and the traffic being continually held up because of uncontrolled pedestrian crossings at three locations, and now the Council want to add an additional crossing opposite the Tower to compound the situation! 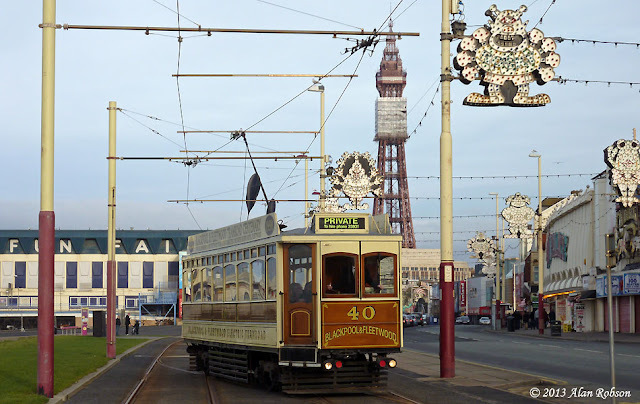 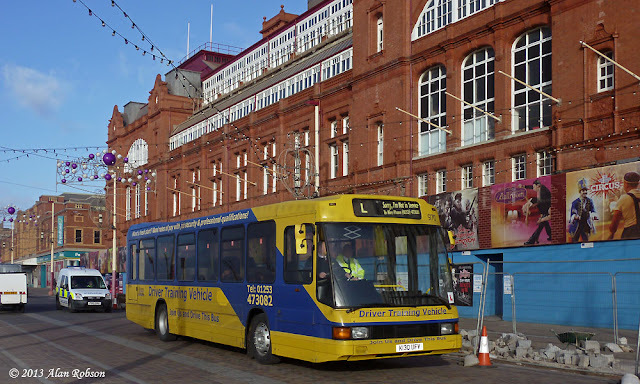 Blackpool's Optare Delta driver trainer 970 is seen passing the Tower, with the southbound lane of the promenade closed off due to defective block paving being replaced, necessitating northbound traffic to run over the non-roadway section of block paving. 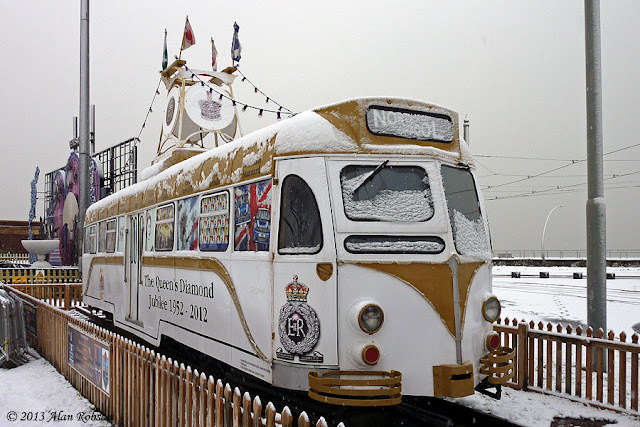 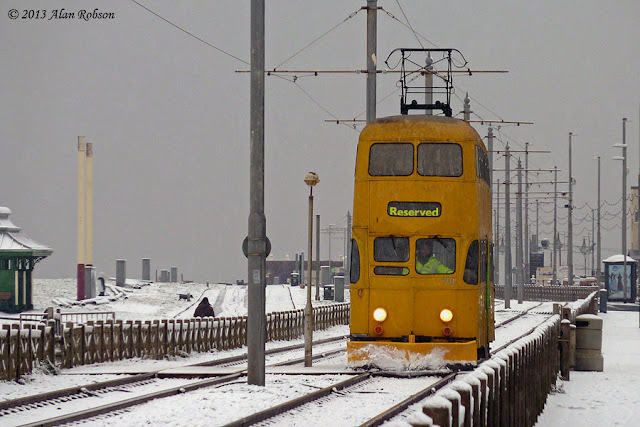 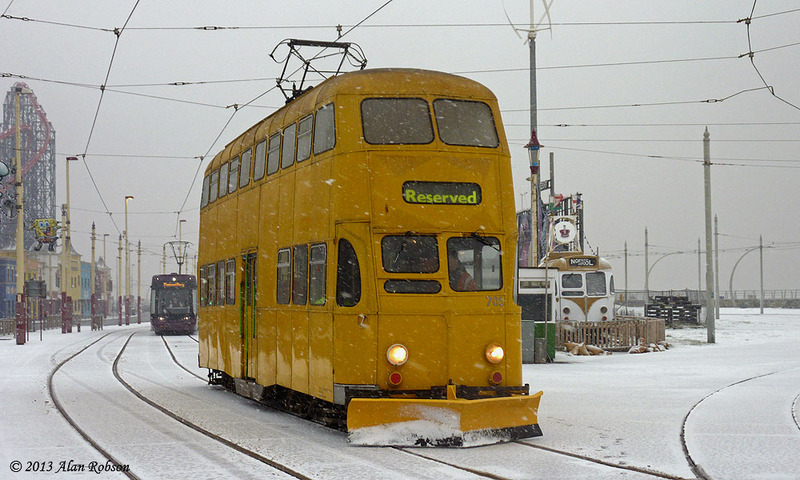 With heavy snow and sleet forecast in Blackpool for the rest of the day from lunchtime (it's already been snowing lightly for a couple of hours), here are some views of Brush car 627 and the Rocket in the snow on Monday 21st January. Today's snow saw snowplough 701 in use again, to clear the system from Starr Gate to Fleetwood Ferry and return. 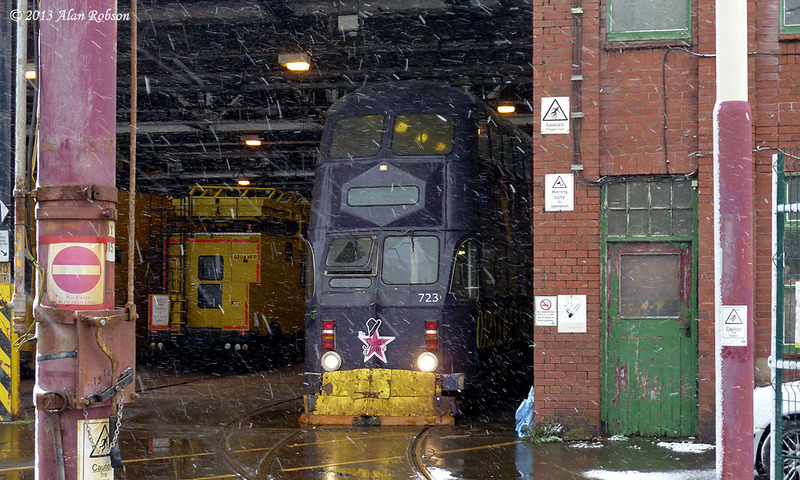 Meanwhile snowplough 723 stayed tucked up inside Rigby Road, parked in front of the electrical bay away from the front of the depot. After last Friday's light covering of snow in Blackpool, residents woke to snow again this morning, this time though the snow continued on and off all day, reaching about 2 cm deep in the worst hit areas around South Promenade before the thaw set in as temperatures crept above freezing during the morning. 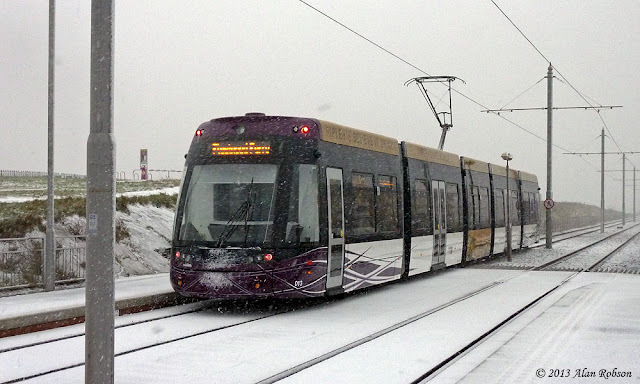 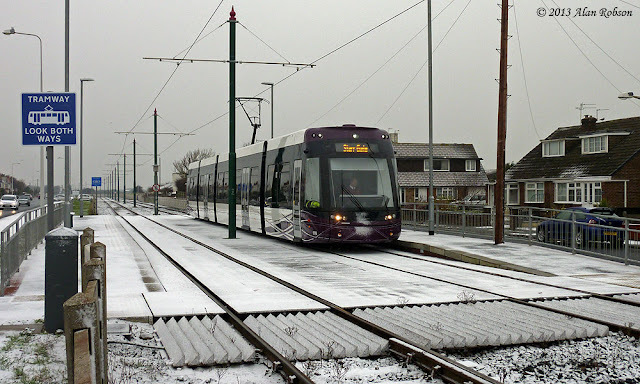 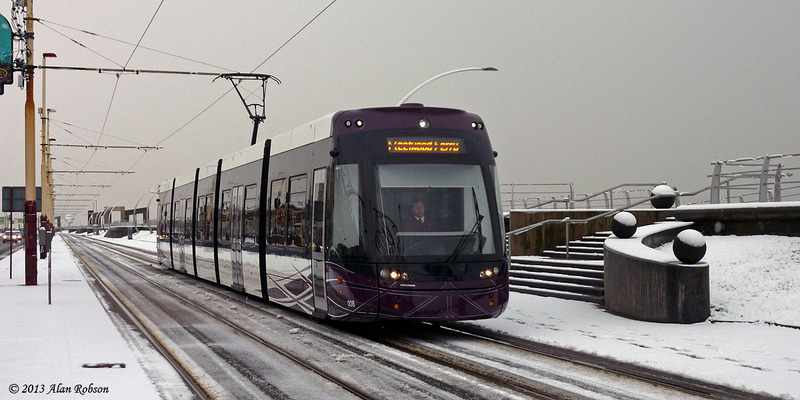 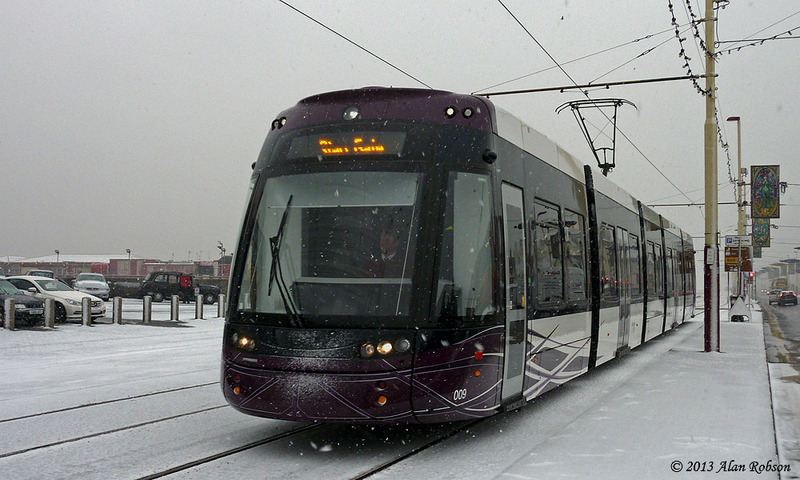 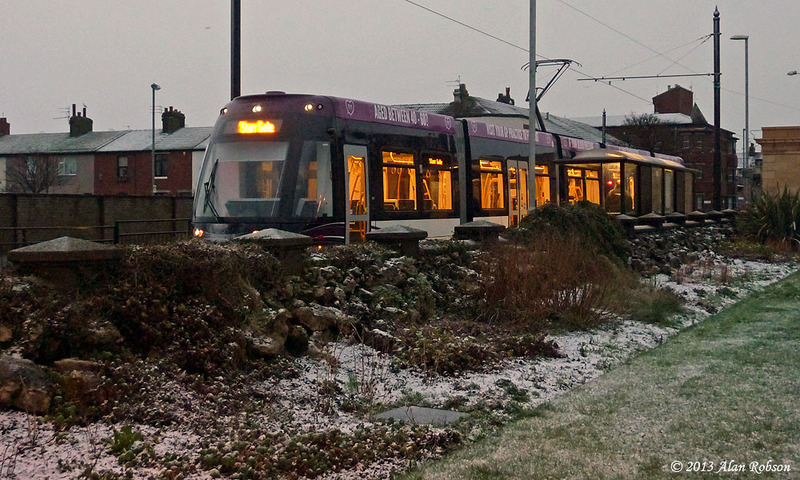 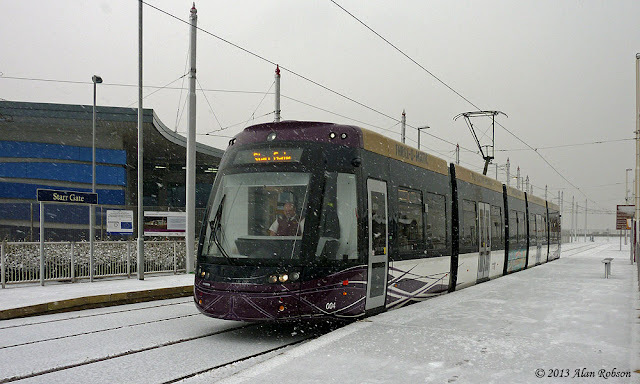 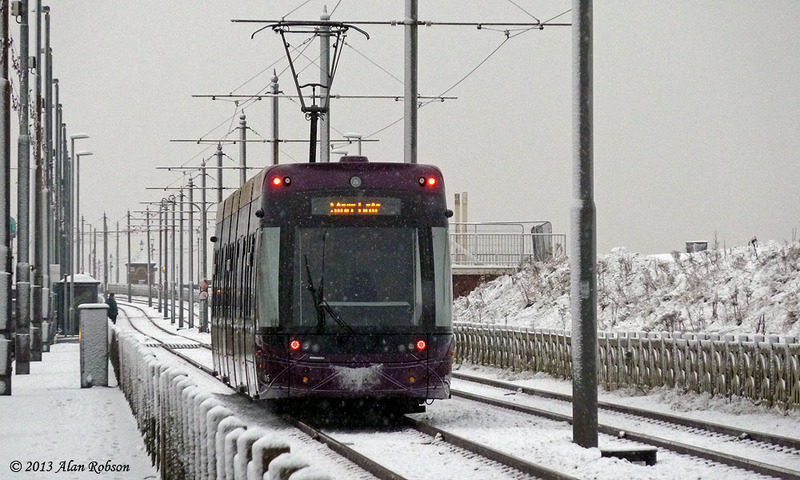 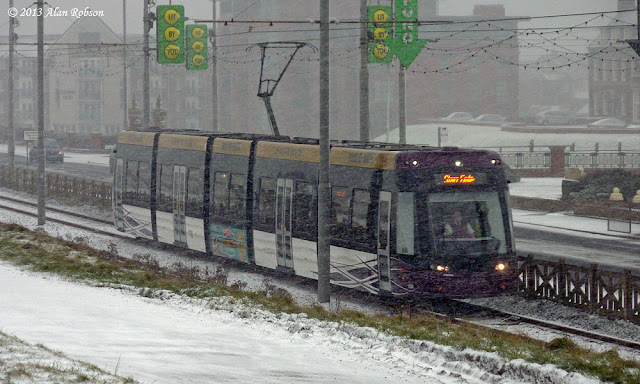 The Flexity 2 trams coped admirably with the snowy conditions, with no gaps in the service noticed during the day. 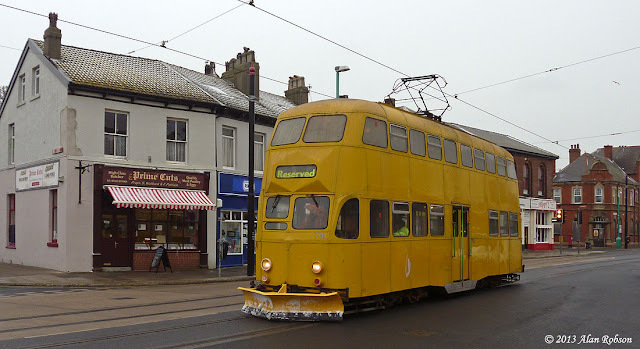 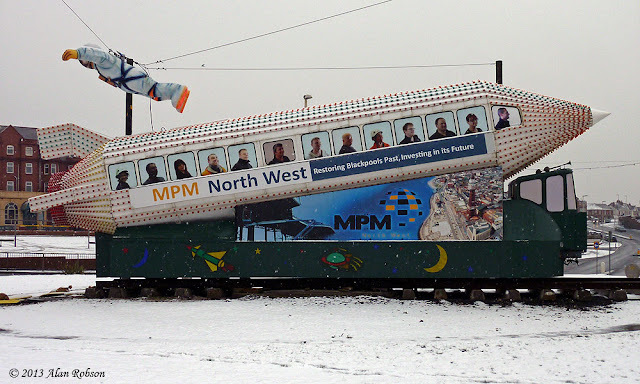 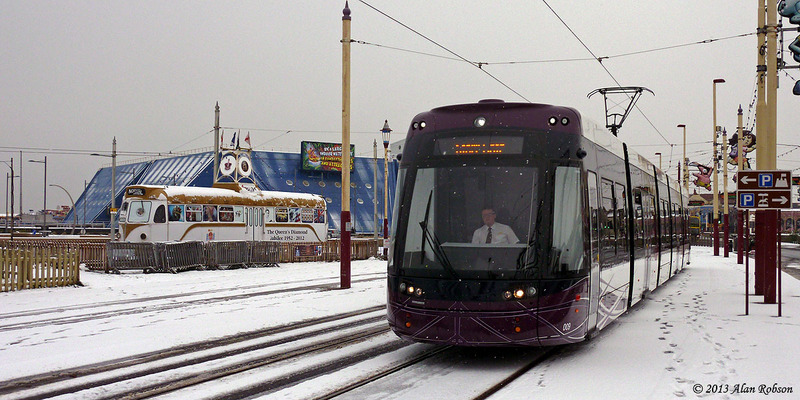 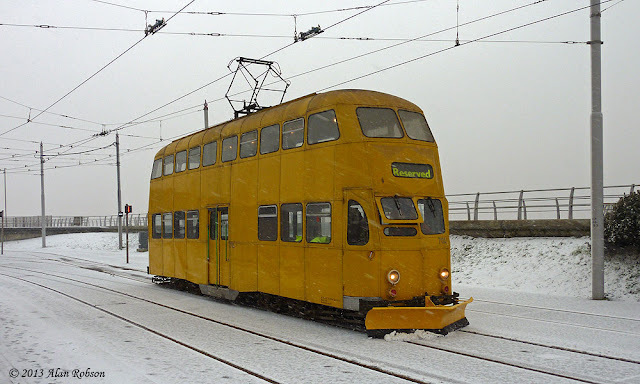 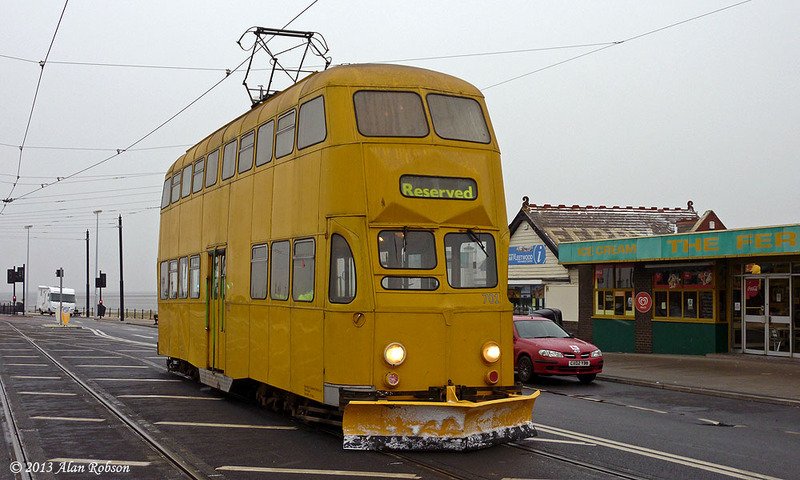 The morning of Friday 18th January saw some short but heavy flurries of snow in Blackpool, which covered the tram tracks with a thin layer of snow, this gave snowplough Balloon 701 a chance to be used in action for the very first time. 701 left Starr Gate depot at 11:15, running all the way through to Fleetwood Ferry where it stopped for a short crew break on the loop before returning to Starr Gate. 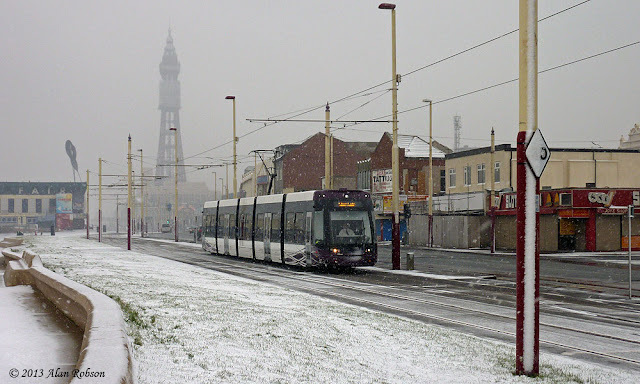 It is not clear why the decision was made to use the snowplough, as there was barely a covering of snow in Blackpool, and even less in Cleveleys and Fleetwood. 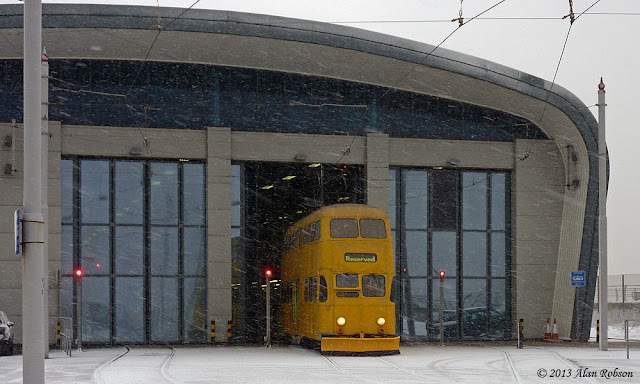 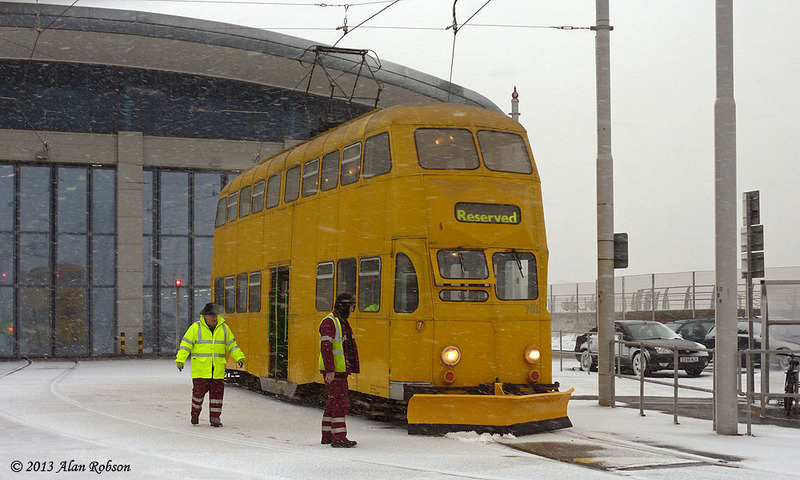 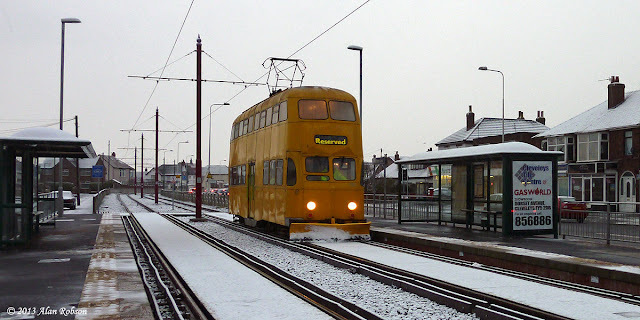 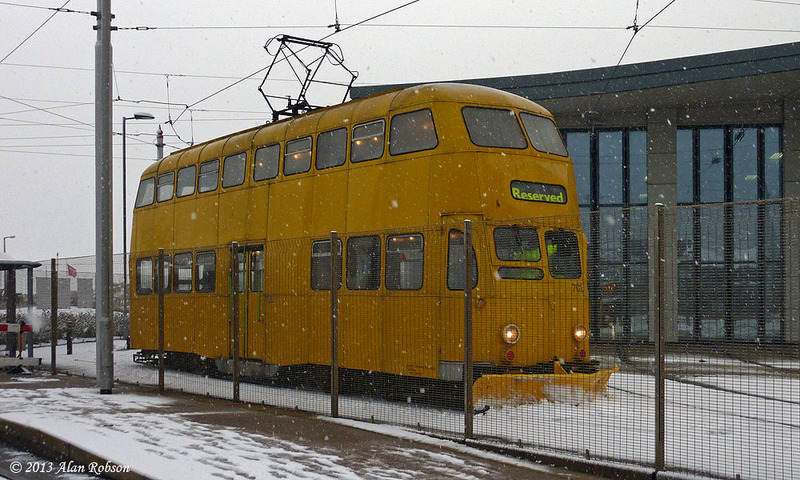 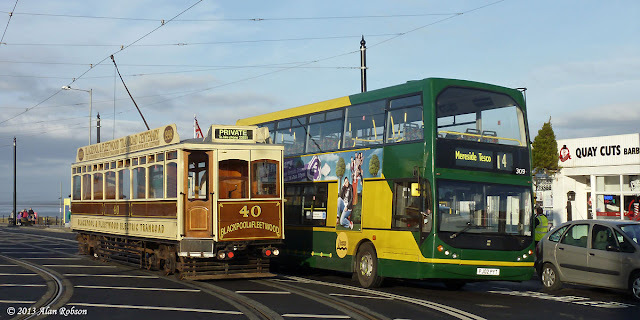 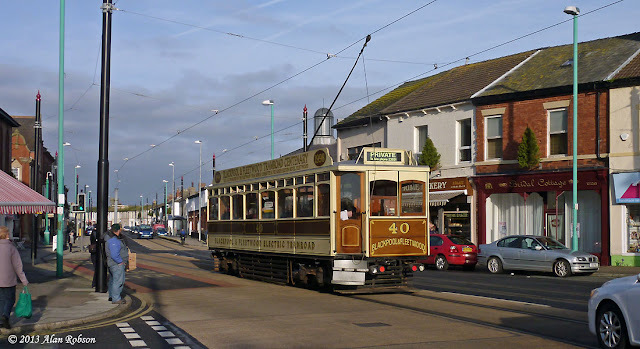 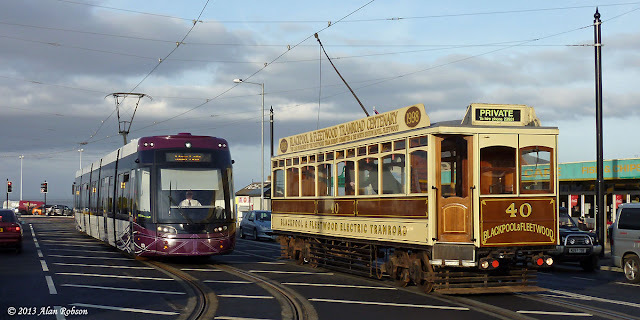 Meanwhile back at Rigby Road, snowplough equipped Balloon 723 was noted powered up with its lights on at the front of the depot, in case this tram too was needed for snow clearance duties, in the event it wasn't needed and was stood down in the afternoon. 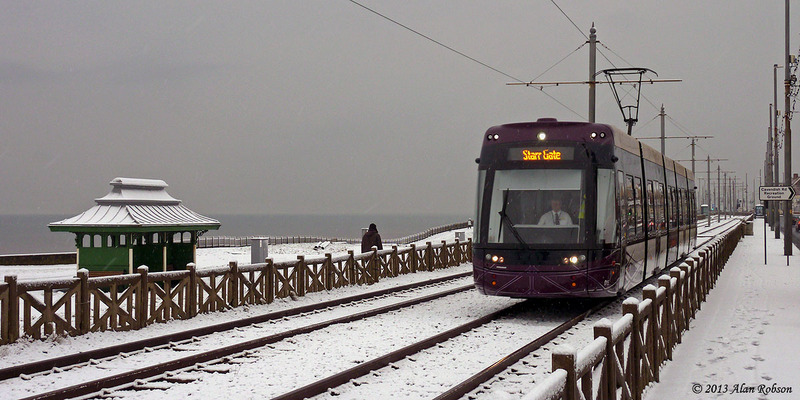 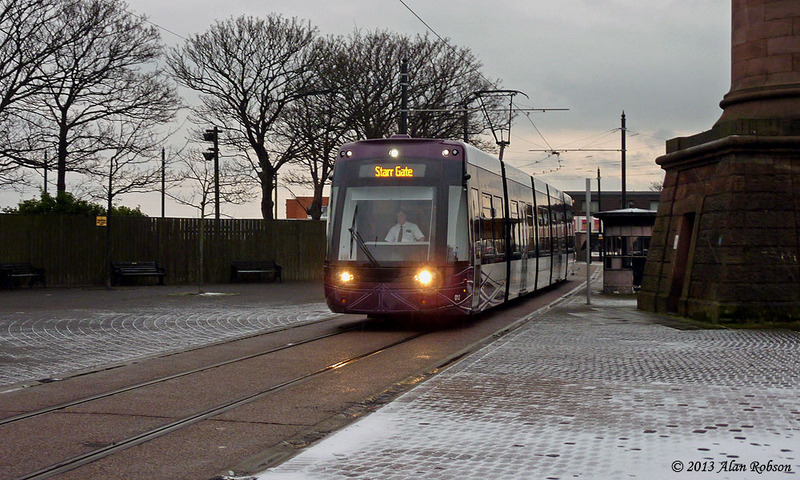 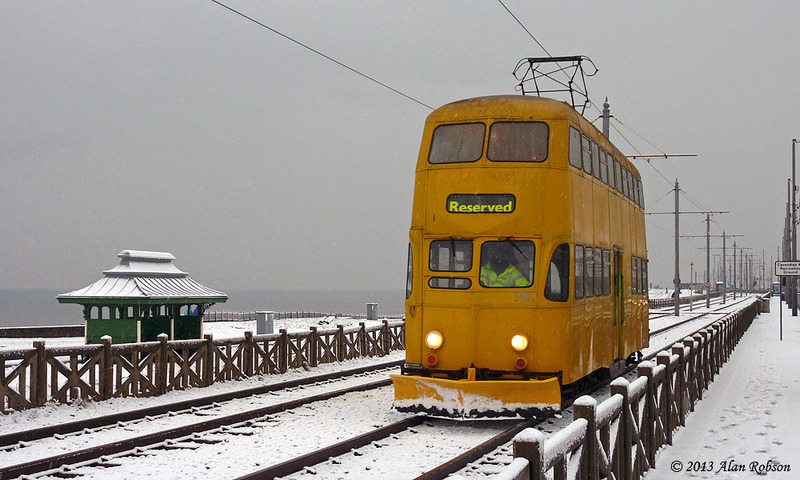 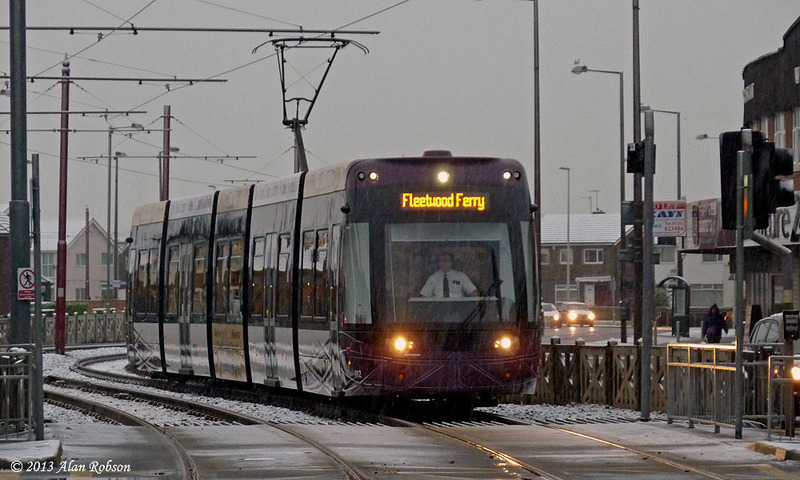 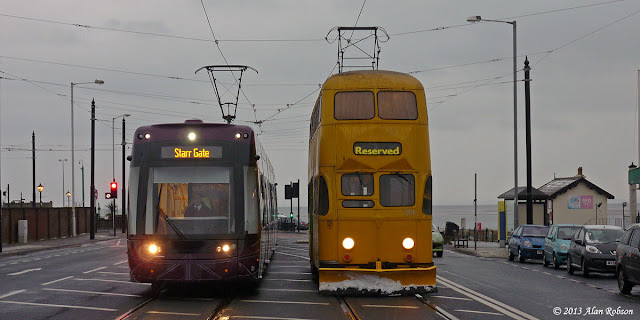 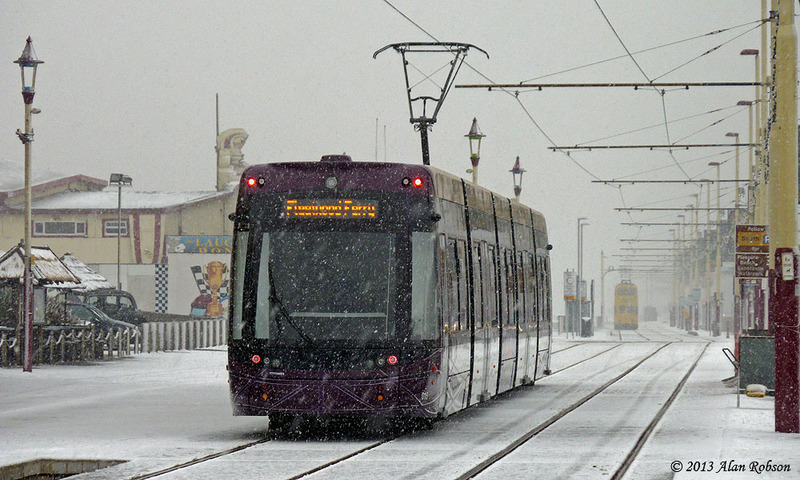 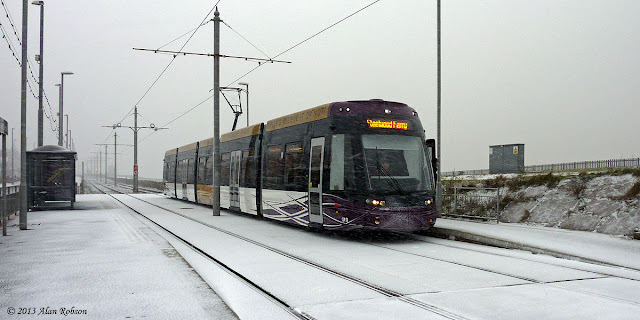 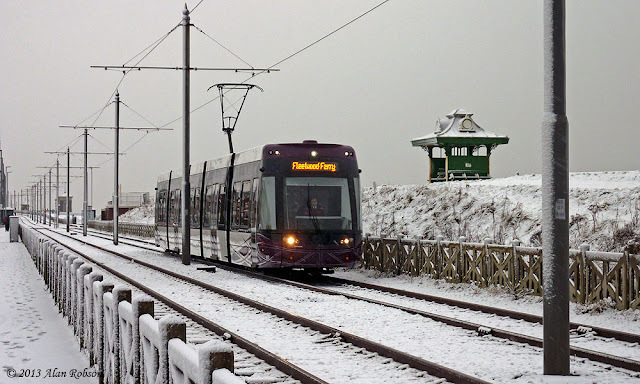 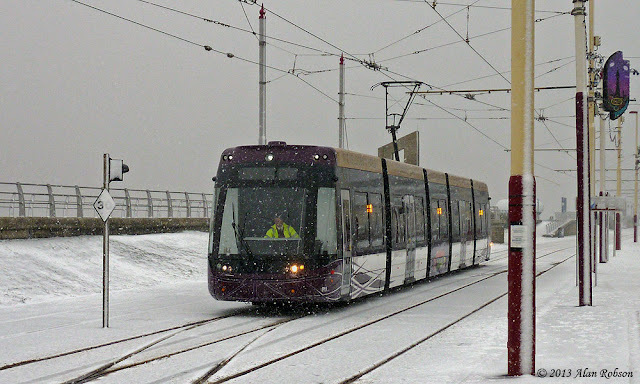 Blackpool received a light dusting of snow this morning, just enough to provide the first chance to get some shots of the new Flexity 2 trams in near white out conditions. The snow only lasted for a few hours, and by noon was beginning to disappear rapidly. 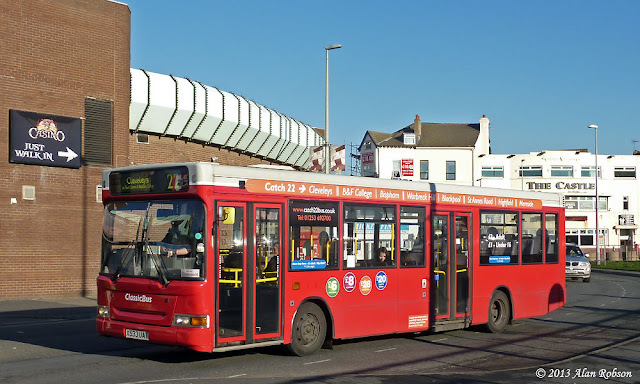 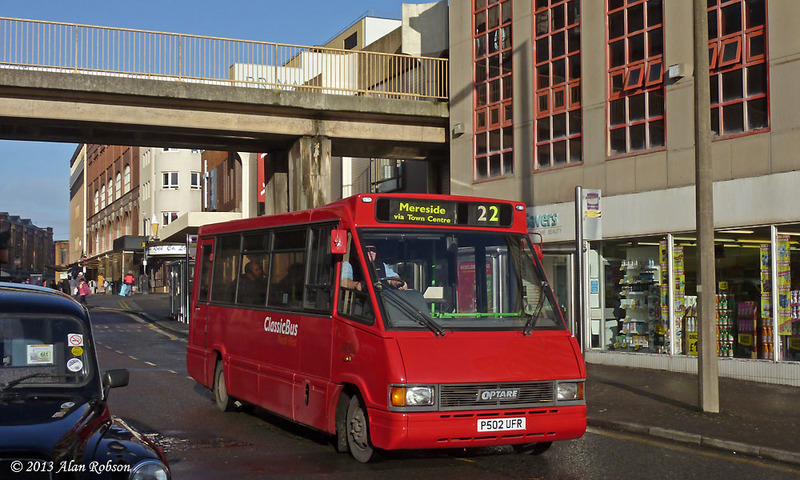 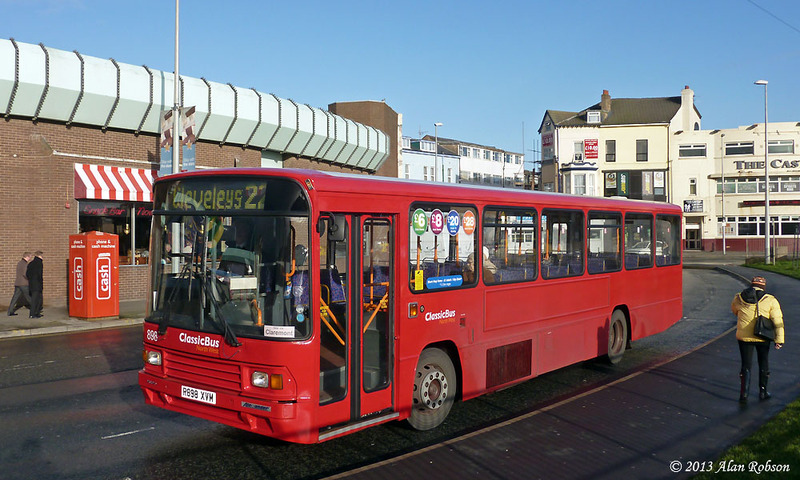 From January 14th 2013, the Catch 22 route run by Classic Bus North West increased its service frequency from twice an hour to every 20 minutes. 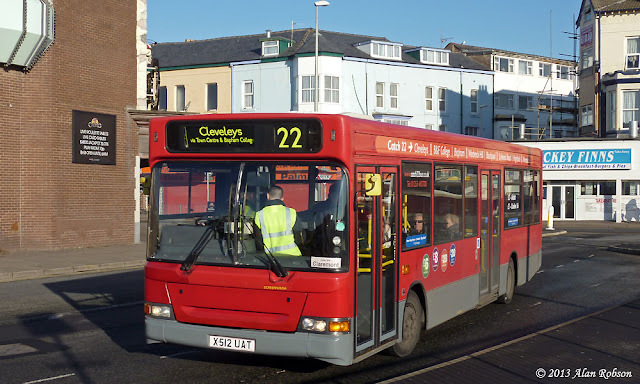 The more frequent service requires an extra two buses to operate it (in addition to the four previously used), enabling a greater cross section of the CBNW fleet to be seen in regular daily service. 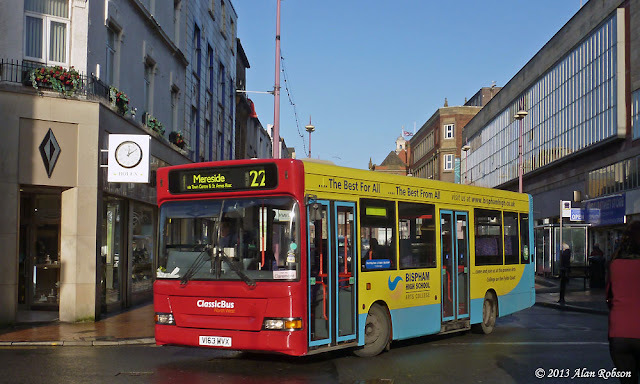 The Catch 22 service seems to be coming more established with the public, as each of the buses pictured here was carrying passengers, unlike in the early days of the service last year when spotting buses running empty was quite normal. 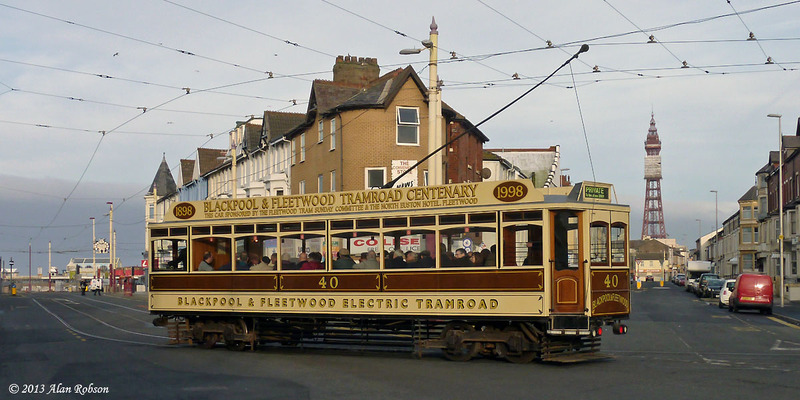 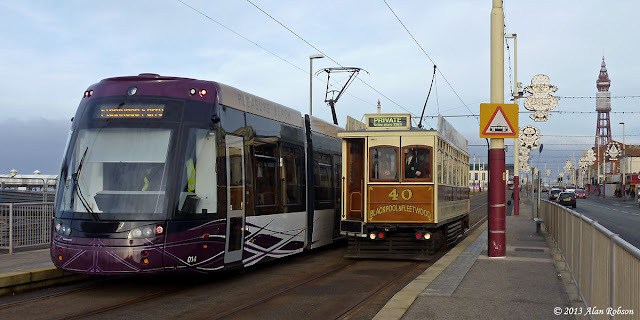 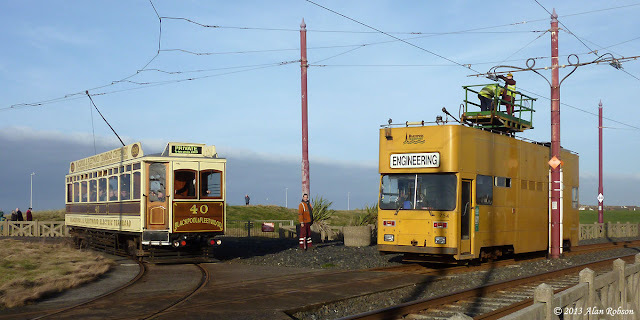 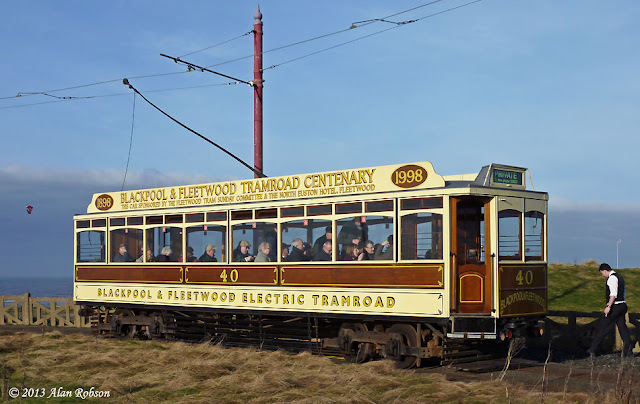 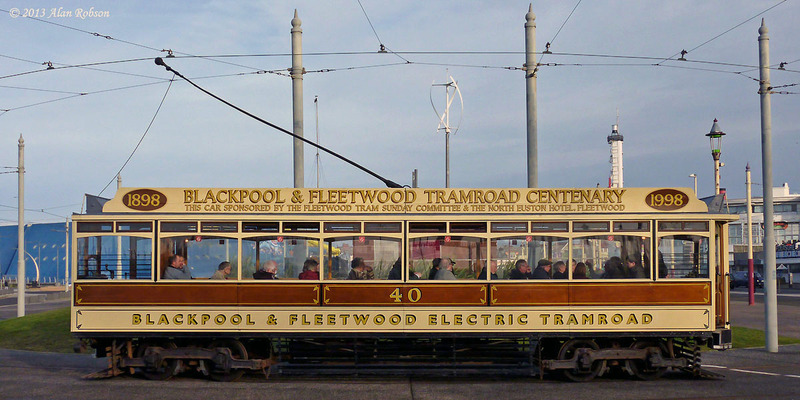 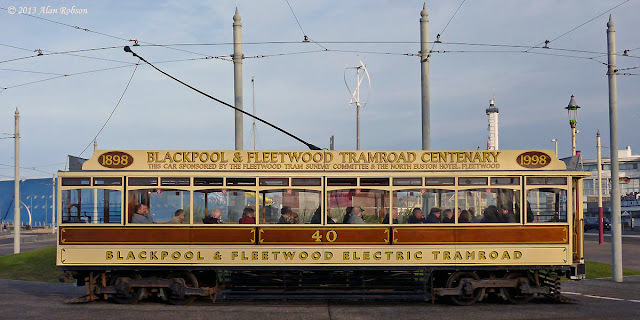 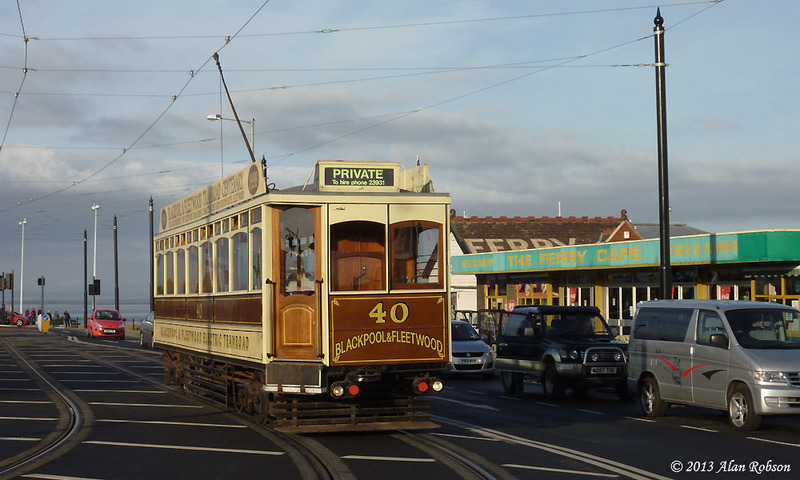 A selection of views taken during yesterdays tour, when the 'Friends of 40' hired Box car 40 to take them to their annual meal at the North Euston Hotel in Fleetwood. 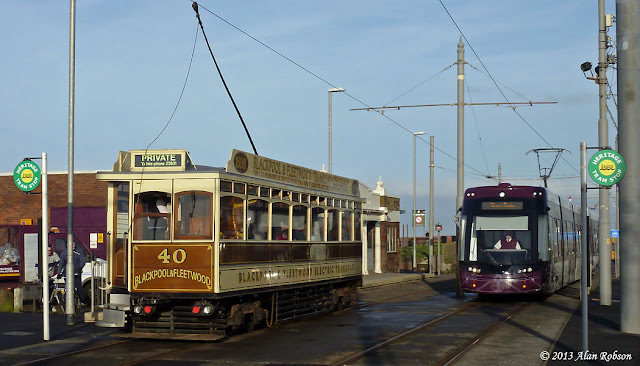 See Saturday's posting for more details of the tour.